On the day of the Ramnavmi, we are all blessed with the darshan of Mothi Aai. Renuka mata has been part of our Mahajan family for at least some 3-4 generations. Bapu saw the picture and explained a few things. The upper part of the face ought to be covered, He said elaborating on the impacts. He even told us about the impacts that a face that was not covered would have. Bapu got the very same idol for Ramnavmi and rendered it siddha. the ‘Sahasraadhaar Abhishek’ would include 27 types of Dhara-paatra. That was the ultimate stroke, I thought! Apart from us now, only the Mahakaleshvar Mandir at Ujjain has it. Since the last 2 years, the abhishek is being offered to the Mother Renuka. Nandai had sent a special message concerning the abhishek. She is a Mother, She is our dear Mother and She has travelled far and long to be with us. She must be received well, received warm affection from the heart. The idol is with us for three days and then at Bapu’s house. The Mother is carried to our village from the Bapu’s ‘Devghar’. Bapu Himself told us that this idol has been with the Mahajan family (my family) for 15 generations. I am the 16th. An interesting point is the idol came to me in chronological sequence. The Mahadurgeshvar installation was memorable too. 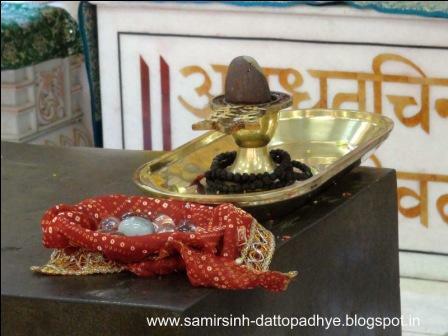 The Mahadurgeshvar Linga is extremely pure and sacred and is the foremost Jyotirlinga of the Kaliyug. This is the Stree-ambikeshvar and its poojan has to be offered in an appropriate way. Bapu often talks about the purity of purpose and of the means as also of the fulfilment of the purpose to accomplish a task. The Jyotirlinga, before it is installed ought to be with a purohit for at least a month, was Bapu’s wish and so it came to our home. We were of course instructed about how the poojan was to be offered. At 3.30 in the morning on the day of the installation, the linga was brought to Bapu’s house from ours. Sameerdada, Paurassinh and Swapnilsinh had to offer the Dandavat 7 times from the main gates of the Gurukshetram to the place of installation after which they could take darshan. It was not just offering the haldi kumkum. A proper procedure was followed. The parikrama (going round the sacred idol) was offered around Happy Home. Drums and other instruments were played. The Jyotirlinga was instyalled. Paurassinh and Nishthaveera did the Navachandi Yaag Anushthan. Bapu was consulted on all topics and meetings were conducted. Aai said, the motive was to list out all requirements, assign jobs, delegate work to people so that the preparations are accomplished before hand and nothing remains to be done at the last moment. This diverts the attention and we do not want it. We want everyone to have work behind them and relish every moment of the poojan.